Registration is $75 until September 6. Registration increases to $90 on September 7. Online registration closes September 28 at 5 PM. The cost to register for Sea Gull Century is $75 and includes a long sleeve t-shirt, course support, food and beverage at all rest stops, and a Friday evening welcome reception. Registration prices will increase to $90 on September 7. Registration will be $90 until September 28 AT CLOSE OF BUSINESS (5 PM Eastern Standard Time). There is no day of registration, but you can register IN PERSON at Maggs gym Friday October 4th until 7 PM. WHAT IF I HAVE REGISTERED AND HAVE BECOME INJURED OR I AM UNABLE TO ATTEND THE RACE? There will be no refunds or transfers to another year. You may transfer your ride to another person. HOW DO I TRANSFER MY REGISTRATION TO ANOTHER RIDER? It is up to the old rider to give the new rider the rider packet. You can pick them up at the information table located in Maggs starting Friday at 4pm or Saturday at 6:30am. This MUST be worn on event day in order to have access to medical services and rest stops. However registration will be open the Friday night before SGC and must be in person in Maggs gym starting at 4 pm. You will receive a confirmation email stating you are registered for SGC. In the email will be your rider number along with your mailing address. If there are any errors please contact us at 410-548-2772 so we can fix any changes and make sure your rider packet arrives to you and does not get lost in the mail. You do not have to check in. It is a show and go start between 7-9 am. CAN I SWITCH THE ROUTE I WANT TO DO? If you decide to change day of please make sure you have the appropriate map for your ride. WHAT DO I NEED ON SGC DAY IN ORDER TO PARTICIPATE? To participate all cyclist must wear their assigned rider bib. Make sure you have your choice of route map that has turn by turn directions. Make sure the SAG number 410-543-6342 is in your cell phone. Please note: we do not provide bottled water or cups. You must bring your own water bottle(s). There are parking maps available online at www.seagullcentury.org. Please make sure to park in areas designated for SGC parking. There will be campus police and student groups to assist you with parking. SGC doesn’t have a specific start time. It’s a start and go between 7-9am. Again, you do not have to check in anywhere nor is this event timed. Due to safety reasons we ask all riders finish by 6 pm. ARE THERE PLACES TO SHOWER AFTER? There are facilities in Maggs gym where you can shower after the ride however you need to bring your own towel and soap. WHAT’S THE DIFFERENCE BETWEEN THE ROUTES? All routes go on at the same time on the same day. Depending on what route you choose you will follow the course map along with the color coded seagulls painted on the street. – Assateague is 100 miles and goes down to the beach. 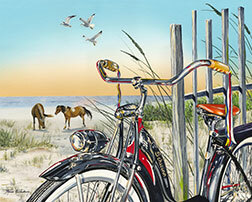 Here riders can see the picturesque Atlantic Ocean and wild ponies that live on Assateague Island. – Princess Anne Metric is 65 miles through Somerset County. The Course Map details can be found at www.seagullcentury.org. Please select one of the two courses you would like to ride. For our event we do not allow motorized bikes/vehicles on the course for Sea Gull Century. This would cover anything from battery to gas powered scooters/bikes/motorcycles. We do allow non-motorized bicycles. I’M COMING FROM FAR AWAY, IS THERE ANY PLACE WHERE I CAN RENT A BICYCLE?